Alec Lewis, one of eight brothers and five sisters, was born in Gloucester in January 1887 to Henry, a builder, and Susan Lewis; two of his brothers, Melville and Tom, would also play for Gloucester. By 1911 Alec was employed as an assistant master at Tredworth Council School. He initially played rugby for Gloucester Old Boys but after a couple of games for the Gloucester First XV in the 1908-09 and 1909-10 seasons he joined the Club on a permanent basis. Between 1910 and 1914 he represented the Club at centre on eighty-four occasions, seventy-eight being for the First XV. During this period he scored fifteen tries and four drop goals for a total of sixty-one points. Returning from military service in the Great War he played a further nine games for the First XV in the 1919-20 season, scoring two tries. 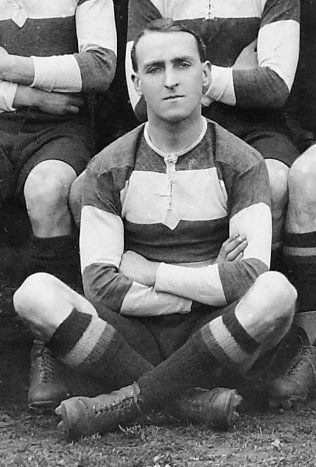 He was also awarded seven Gloucestershire County caps between 1913 and 1920 and scored one try for the county. Although Alec was a promising and prominent Gloucester player in the seasons prior to the Great War, he came to even greater prominence by his conduct on the battlefields of the Western Front. On the outbreak of war in 1914, Alec Lewis enlisted as a Private (2693) in 1/5th Battalion (TF), Gloucestershire Regiment. The regular season might have been cancelled for the Gloucester players but there was no reason why rugby should not continue for the player-soldiers as part of the Battalion XV and games against other battalions and regiments continued throughout both during training and behind the lines on the Western Front. In September 1914 whilst based at Chelmsford Private Alec Lewis wrote to The Citizen on behalf of the rest of the team with thanks for the parcel of cigarettes and other luxuries sent by the people of Gloucester. He reported that the Gloucester Rugby Club would be well represented in 1/5th Gloucesters XV with at least eighteen players who he listed as “C. Cook, Webb, Lewis, Hamblin, Washbourne, Wilkes, Sysum, Smart, Parham, Meadows, Millard, Ayliffe, A. Cook, Harris, Dovey, Kingscote, Osbourne, Cummings…” together with “… many other reserves.” Despite many challenges the 1/5th Gloucesters XV was undefeated throughout the war. The battalion landed in France on 29 March 1915 and Alec was promoted to Lance-Corporal (27 May 1915). However following the disastrous attacks at Pozières in July 1916 during which five Gloucester rugby players were killed including both Alec’s two brothers Melville and Tom Lewis and his brother-in-law, Sidney Sysum, he was granted a commission as a Second Lieutenant on 31 July 1916. After a period of officer training he joined the 6th (Service) Battalion, Royal Berkshire Regiment and attained the rank of Captain before transfer to the 4th Battalion, Intelligence Corps where he was promoted to Major. Throughout the war Alec was wounded three times. However his war was characterised by his bravery which was recognised whilst serving with the Royal Berkshire Regiment and he was awarded two Military Crosses (Military Cross and Bar). His first Military Cross was gazetted on 11 December 1916 and the citation in the London Gazette reads “For conspicuous gallantry in action. He assumed command of a company of another unit, reorganised bombing sections and successfully dealt with the enemy and at a critical time. He set a splendid example”. He won his second Military Cross on 14 December 1917 and his citation in the London Gazette, 19 April 1918, reads “For conspicuous gallantry and devotion to duty in carrying out the duties of brigade intelligence officer. During some reconnaissances, made under heavy shell and rifle fire, he gained most valuable information regarding the ground and our dispositions. On one occasion he made a reconnaissance along the front line in close proximity to the enemy and under fire from their snipers”. “The Citizens of Gloucester through their representatives, the Mayor, Aldermen and Councillors, desire to place on record the splendid services rendered by you both to the State and to the City during the greatest war in all history waged from 1914 to 1918. Ever mindful of the ready response to the Country’s call, of all the hardships endured, of the courage displayed by all branches of the Service on Sea, on Land and in the Air, the Citizens of Gloucester ask your acceptance of this token of respect, admiration and gratitude, so that it may be preserved as a treasured possession during the life of the recipient, and as an example to all who come after, of duty to King and Country well and nobly performed”. The scroll was signed by J.O. Roberts, the Mayor of Gloucester. Alec remained in Gloucester for a short period which enabled him to play a few more games for Gloucester, but he soon moved to Birmingham to work for Dunlop Rubber and remained there for the remainder of his life. He died on 27 October 1941 at Meriden, Warwickshire aged 54 years. He was cremated at Perry Bar on 31 October 1941 and at the instigation of his employers he was accorded a funeral with full military honours.